SUMMARY: Every marketer must \"bring something to the table.\" Each marketing position requires certain competencies that do not always show up on a résumé. Most often, these mental capacities can be key determinants for success. Marketers must be able to integrate themselves into a team to achieve success. This week’s chart analyzes the importance our 1,600 survey respondents placed on each of the four aptitudes necessary for personal and professional success. 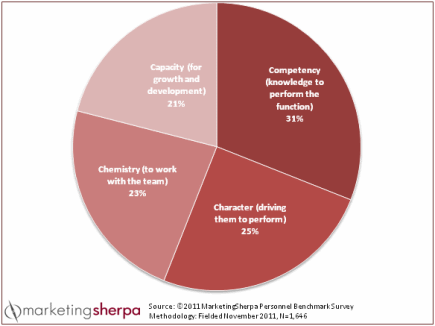 The vast majority of respondents in our 2012 Marketing Personnel Benchmark survey were CMOs or managers. Therefore, it is not surprising that they are looking for people that will show up, accept direction and get the job done. HR, by direction from Marketing, will focus its screening processes and interviews on these specific areas to ensure the department gets the best possible candidate. However, if HR is involved, they may not understand the chemistry or demands of the department. Additionally, an individual’s long-term aspirations will rarely be a deciding part of the interview process. Competency – “Can they do the job?”Does the individual have the observable abilities, skills, knowledge, motivations or traits defined in terms of the behaviors needed for successful job performance? You must know if the individual has depth in the requisite abilities and/or qualities to function, respond or develop in a particular way. This is where most employers focus the majority of their attention – and rightly so. However, even if a person has the skills, this does not mean that they enjoy the work, find satisfaction in the work, or see the work as providing value to themselves and others. Character – “Will they do the job?”All individuals possess mental and ethical traits that individualize them. These characteristics are what make one person distinguishable from others. Most managers want marketers with the integrity and work ethic that distinguishes them as trustworthy, loyal and a person who can be counted on when needed. Just because an individual has the “competencies” does not mean they will perform well, especially if they are operating under work-related stress from an improper job fit. The second two aptitudes revolve around the people aspects of job performance. Because the vast majority of people (67%) are relationally oriented (in comparison to task oriented) understanding and developing an ability to apply them determines a critical aspect for a marketing manager’s success. In order to achieve long-term success and personal satisfaction, the CMO or marketing manager must cultivate an internal desire for each marketer to perform over a long period of time. Continued, sustainable excellence can only be achieved when a marketing manager develops the people attributes in his/her team members. This is the primary reason marketers leave their positions – NOT because of competence or character issues. Chemistry – “Can they work in our culture and well with our team?” Psychologists agree that about two out of every three individuals possess the desire for relationships to work well together. However, just because people enjoy working together does not mean they will enjoy working with your marketers or other company associates. In most work environments this is a very specialized and measurable culture which, if interrupted or tampered with, will have an impact on the efficiency and effectiveness of all team members. There must be mutual attraction, attachment, or sympathy between people working together making their interaction harmonious or effective. This is why there is often conflict between sales people and marketers or marketers and purchasing agents – they are not looking for the same type of environment. Even very competent individuals with a strong work ethic and character will not remain in what they perceive to be an abrasive or difficult environment. 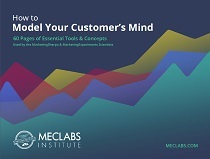 Most marketers have the ability to receive new information or concepts which will help them perform at a higher level. This is true of a vast majority of marketers, meaning you must pay attention to their potential or you will lose them. Yes, there are some who are at the top level of their potential and must be considered differently. They will remain content doing what they feel they have mastered or what provides them with a high level of comfort. However this does not pertain to most marketers. Top CMOs and marketing managers hire people with the potential to perform at higher levels. Ignoring this potential is the number one reason marketers leave jobs, develop morale issues, or become disgruntled. The manager, not the company, is responsible for helping to strategize, and advance each marketer’s growth and development process. Failure to do this will be blatantly ignoring the primary individual issue for marketers today. For additional research data and insights about Marketing Personnel, download and read the free Executive Summary from the MarketingSherpa 2012 Executive Guide to Marketing Personnel.